NEW YORK, April 17, 2019 /CNW/ - Mazda Canada Inc. (MCI) announced today at the 2019 New York International Auto Show the arrival of the 2019 Mazda CX-5 Signature AWD featuring the Skyactiv-D 2.2-litre diesel engine, with sales in Canada beginning in the second half of 2019. The 2019 CX-5 Signature AWD with Skyactiv-D 2.2 provides a high torque driving experience and revs freely at high rpms. The Skyactiv-D 2.2 engine is estimated to deliver 168 horsepower at 4,000 rpm and 290 lb-ft of torque at 2,000 rpm with NRCAN-estimated 8.9 litres per 100 kilometres (L/100km) in the city, 7.9 L/100km on the highway and 8.5 L/100km overall. A sequential twin turbocharger realizes smooth and linear response from low to high engine speeds, and greatly increases low- and high-end torque (up to the 5,500 rpm rev limit). 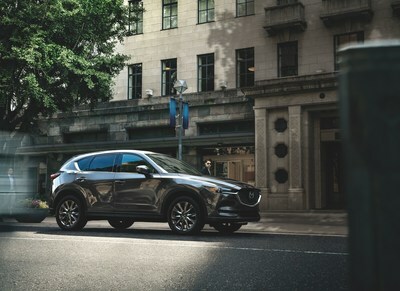 The Skyactiv-D 2.2-litre engine in the North American-specification CX-5 adopts special combustion control software and exhaust treatment to meet the strictest emissions regulations in the U.S., yet preserves the excellent response and easy-revving feel for which Mazda's Skyactiv diesel engines are renowned. Mazda worked closely with all proper federal and state agencies in the U.S., such as EPA and CARB, to ensure that the Skyactiv-D 2.2 engine passes all appropriate regulations. The addition of the Skyactiv-D 2.2 expands the engine lineup for the 2019 CX-5, which already includes the Skyactiv-G 2.5 turbo and Skyactiv-G 2.5 with Cylinder Deactivation. This provides Mazda fans another option to enjoy the popular compact crossover and addresses the strong demand for a diesel engine in North America that offers a premium driving experience. The 2019 Mazda CX-5 Signature Diesel will be on sale at dealers in Canada beginning in the second half of 2019 as a 2019 model year. Pricing and detailed specifications will be released closer to sales start. Mazda Canada Inc. is responsible for the sales and marketing, customer service and parts support of Mazda vehicles in Canada. Headquartered in Richmond Hill, Ontario, Mazda Canada has a nationwide network of 164 dealerships. For additional information visit Mazda Canada's media website at www.media.mazda.ca.